HORZE - 18-Tine Head ! RRP: 8,95 € tax incl. Because the teeth of stall cleaning pitchforks are bound to break, HORZE offers a durable replacement Head. This pitchfork head will fit one of the many old handles cluttering up our tack rooms and barns. Speed manure removal from the stall, barn, stable, or trailer. Ingenious horse manure fork features a large, built-in basket to trap more waste, but let bedding and shavings fall through. Simply scoop the manure, tilt the fork backwards, and tap on the floor. The manure stays in the basket. Bedding falls to the stall floor. Then simply dump the waste into your muck bucket or wheelbarrow and remove from the premise. The entire design saves you both time and money in saved bedding, because all you discard is the manure. 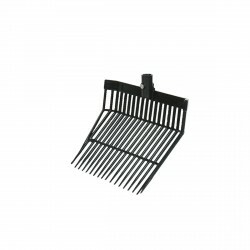 Durable basket-shaped horse manure fork speeds stall mucking. Lightweight design features tough plastic tines. Easily clean your stall, barn, stable, trailer, or pathways in less time. Save money, simply replace your fork head instead of buying a complete set. Ready to take on any tough job.